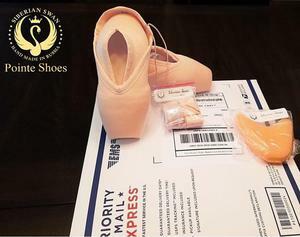 Tickle Pink has been working with dancers all over the country to get them into this pointe shoe. While we all would love to have a traditional in-store fitting, this process has been extremely exciting and very successful for both Tickle Pink and the dancers who give it a try. We will ask you for a few things to begin the fitting process​. These requests are truly necessary for us to get the dancer's foot shape, flexibility of the dancer's arch, any extremes such as longer 2nd toe, bunions, etc. We will ask that you measure the dancer's feet according to Siberian Swan's instructions and be as thorough as possible with these. We will also ask for the dancer's current pointe shoe brand, model and size including width and shank strength. It will also be important for us to know what the dancer likes and dislikes about the current pointe shoe. Tickle Pink will cover shipping to you. Returns for shoes not purchased are at the customer's expense. Tickle Pink will review all photos carefully and ask very crucial questions once shoes are received and on the dancer's feet. For a professional fit, Tickle Pink will need to see photos to see what is needed for the dancer's foot. We do recognize that this shoe is not for everyone and, at times, we have not been able to achieve a perfect fit online but most often, dancers are very happy once the fit is just right. Please note that it can take a couple of mailings back and forth to achieve just the right fit ... be patient! It's worth the effort if a dancer is meant to be in the Siberian Swan Pointe Shoe! If you are interested in trying an online fitting, email missy@ticklepinkdancewear.com to get the process started! Because this is a tedious process and no fitting fees are applied (whether a purchase is made or not), Tickle Pink will invoice for any and all shoes not received back in the store within 14 days of original shipping date. Shoes must be shipped back in brand new condition. No break in techniques are to be done prior to purchase. Sometimes, depending on stock availability at the store, tracking numbers must be sent to Tickle Pink before a second shipment can go out. As always, once ribbons and elastics are sewn to the shoes, the shoes will have to be purchased and no refunds / exchanges can be made. Additionally, if there is evidence of wear on the shoes or they are damaged in any way, the shoes will have to be purchased. Custom ordered shoes are not returnable and are the customer's responsibility. If any wear is obvious to Tickle Pink or if any obvious signs of manual break in has been done to the shoes, the shoes are the responsibility of the customer. All returns are at the expense of the customer. A billing email address must be provided before a shipment leaves the store. In most cases, the store will only invoice customers for shoes that are a proper fit. This is at the discretion of the store owner. After fitting and initial purchase, additional purchases must be prepaid before shipping. The initial fitting / payment policy is a courtesy that Tickle Pink provides its Siberian Swan online fitting customers.